Daily Illuminator: Take A Detour With Munchkin Side Quests! April 20, 2018: Take A Detour With Munchkin Side Quests! What do Munchkin Cthulhu and Munchkin Apocalypse have in common? Well, they're some of our best-selling games! There's another thing, though – you can win the game through alternative means. This feature makes them truly unique in our Munchkin lineup, and we wanted to offer a similar option for our other Munchkin games. 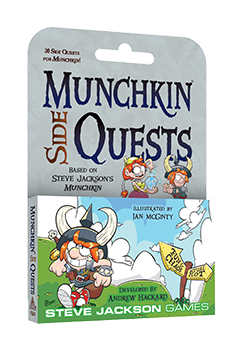 Enter: Munchkin Side Quests! This mini-expansion is special, including 30 cards that form their own deck of secret goals (not mixed into the existing Munchkin cards). Players draw these secret goals, and when completed, they provide a cool bonus! In addition, when a munchkin completes three different quests, the next Monster they fight is for the win, no matter the level. If you want to try to get to level 10 to win, that's great, too! But why not take a shortcut? Plus, you get a ton of new art from Ian McGinty (Munchkin Guest Artist Edition, Munchkin Collectible Card Game). This is a new way to play any version of Munchkin! Find it at your local game store Fall 2018.